Ten years after releasing Hybrid Theory (with sales of over 10 million copies, it's one of the world's most successful debuts), Linkin Park have issued their fourth album, A Thousand Suns. Produced by Rick Rubin and Linkin Park co-vocalist Mike Shinoda, it's a meticulously crafted collection of songs - riveting hodgepodges, in many cases - that defies easy categorization. Full of experimental sonic collages that shift seamlessly from rock to hip-hop to industrial grind, the album sees Shinoda and lead singer Chester Bennington rapping less and singing to an even greater degree than on the group's previous effort, 2007's Minutes To Midnight. 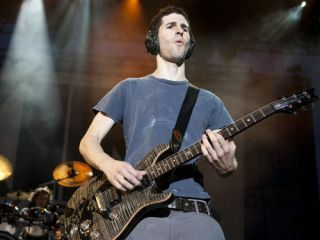 "I think that this record is the latest step in the evolution of the band," says guitarist Brad Delson. "In terms of the direction that the group takes in the future, I believe and I hope that we'll continue to have the spirit of openness that's helped us to this place. "With respect to the vocals, that's certainly been a defining factor, the openness and the talent that Mike and Chester have to tackle a lot of different styles, whether they're singing or rapping or complementing each other in various ways. It gives us a broader palette in the studio from which to draw, and it makes it a lot more fun." Having just completed dates in South America and Europe, Delson is home in Los Angeles for a week before Linkin Park travel to Australia and then hit the US for a two-month trek. On a rare day off, he took time to talk to MusicRadar about the recording of A Thousand Suns. You're pretty much known for playing Paul Reed Smith guitars. Did you stick with those on the new album? "So what was really inspiring for me was to work in the studio and try things that I wasn't familiar with or accustomed to. To be fair, I did play guitar on the record. However, overall, with respect to my contribution, the record was really driven by a lot of electronic experimentation, like keyboards. But a lot of that was done by taking conventional sounds and manipulating them in Pro Tools, using plug-ins and editing, to maybe even disguise the origin of the sound. "Rick Rubin noticed early on and fastidiously encouraged us to maintain a standard where each sound in a song sounded unique and hand-crafted, and yet you don't know what it is. Something that sounds like a guitar may have been piano, or it may have been a vocal. Or if we used a guitar, we may have manipulated it to the point where you don't know what it is. The juxtaposition of all of these organic and synthetic sounds helped to craft the sonic identity of A Thousand Suns." In doing this, however, did you feel less like a band? As opposed to being in a room and playing together, you're crafting and layering parts. "We've never really been a band that records in a room together. Rick described this as more of a hip-hop project. We've always approached our music as more of a studio endeavor. Not that we can't or won't, but we usually don't sit in a room and jam out ideas; usually, one or two guys has an idea, and the rest of us have an opportunity to flesh it out or take it in an infinite number of directions. "We meet once a week or a few times a week - sometimes with Rick, sometimes not - and we listen to basically every iteration of that song and give notes. It's a completely open process. Fortunately, we've reached a place on this record where no one's precious about their ideas. We try anything and everything. Ultimately, with the guidance of Rick and Mike's guidance in the studio, we're able to move each song from its initial seed to something that's incredibly fleshed out and three-dimensional." Generally, who brings in the demos, and what form are they in? "Anybody can bring in an idea, and any one of us can work on anything. On the last record, we started listing the band members' names as opposed to what instrument they played, because anyone can play anything. Mike can play drums; Chester can play guitar; a lot of us sing strange background vocals. To an extent, we have our primary roles in the band, the instrument on which we're the most capable. But sometimes the most interesting stuff comes from a guy who doesn't know what he's doing. [laughs] That's why I didn't use the guitar as my go-to choice on this particular endeavor, because I was excited to try things and fail and succeed in areas that were totally new to me." Can you give me an example of one such success? "One example would be on a song called Robot Boy. There were tons of sounds in that song, and it started out as a different kind of song. I think I spent two days straight at NRG Studios, literally just editing and moving things around and running things through plug-ins. I spent a lot of hours tinkering. I didn't know if anybody would actually like it, and I had to be open to the idea that they wouldn't. But the direction that the song started to take was the popular one. I love getting immersed in the details of the editing, and I'd say a big part of my contribution to this record was such. "Everyone was involved and contributed notes and ideas. If even a couple of guys didn't like a part, we'd continue to work on it until everyone loved it. That's why we had a lot of confidence in the sense that we knew we'd made a very different record, a very experimental record for the band, which is scary to do, to reinvent yourself when you already have something that people like. That confidence came when we finished the record, and all six of us and Rick loved every song, every moment - and we all have very different tastes. We felt like this was the best that we could do, and we're proud of it, and we're confident that there'll be someone out there who will feel the same way." So you didn't play much guitar on the record. However, on those occasions when you did play guitar, which makes and models did you pick up? "My go-to is always that PRS, the Custom 24. It's got a great tone, and it's such a versatile guitar. Whatever you need, if you're not sure to get it, it'll give you the tone. "But of course, we used a lot of different guitars. We used an SG, Strats - new and vintage. I played acoustic guitar a bunch, particularly on the song The Messenger. I don't know the make of the guitar; it's like this old, beat-up guitar. I didn't even see a name on it, but it sounded great and had a lot of character." Who were some of your early guitar heroes? Who inspired you to start playing? "I started playing in the late '80s, so I was inspired by a lot of the harder rock music, everything from Metallica to Led Zeppelin to Guns N' Roses. And then, obviously, when Nirvana hit, that's what I loved - along with everybody else. [laughs] Then I discovered some of the British music like The Smiths and The Cure. In college I listened to a lot of hip-hop and rap. Now I listen to a lot of folky, singer-songwriter music, quieter alternative music, along with some Indian music." You're not known for taking big guitar solos, but do you have any kind of practice routine? Do you do anything to work on your chops? "When I was young, I played the guitar every day for three or four hours a day. I did that for probably 10 years. And I took lessons and taught lessons. On tour, I play every day on stage for 90 minutes to two hours. To me, it almost feels like the guitar has a familiarity on stage, where I'm not really thinking about what I'm doing - I'm just performing - and that's really nice." Talk to me about the general band vibe in making this record. I did an interview last year with Chester when he had his side-band project, Dead By Sunrise, and he was very candid about some of his personal issues. Was he OK making this record? "The band vibe was really fantastic with this record. It moved into a very positive direction starting with Minutes To Midnight. Rick kind of shepherded this open environment that I described earlier of, you know, 'Let's try everything. Let's listen to it together.' It took most of that record to accept what he was suggesting, and when we started this record we were already there. From the get-go, we had this open, creatively ambitious, experimental attitude that we were going to do something really artistic and fulfilling. We were all committed to that. No one was holding on to any notions of what it should be or had to be. It was such a fun record to make." Because of manner in which you recorded A Thousand Suns - layering parts, not playing together - does that create a greater challenge when translating the material to the stage? "It is a challenging process because the nature of the record is studio oriented. We're not leaving bread crumbs, you know? When not helping ourselves out when there's eight guitar parts and there's only two or three guys who are going to play guitar on stage. It's a really interesting challenge, and we spent a lot of time in rehearsals to, as you said, translate it to a live setting. I think we've been very successful at that. It's required us to individually play a lot of instruments that we haven't had to in the past. On some of the songs, I think all of us are singing. And there's one song where I'm playing the drums and singing and then playing the guitar…or the keyboard. The same goes for all the guys - they're playing a lot of different instruments throughout the show, particularly on the newer songs."